Welcome to our Budget DIY Kitchen Remodel project. Links to each step of the project can be found on our Budget DIY Kitchen Remodel home page. I gave the cabinets 3 days to dry after their last coat of primer before moving onto the final coat. 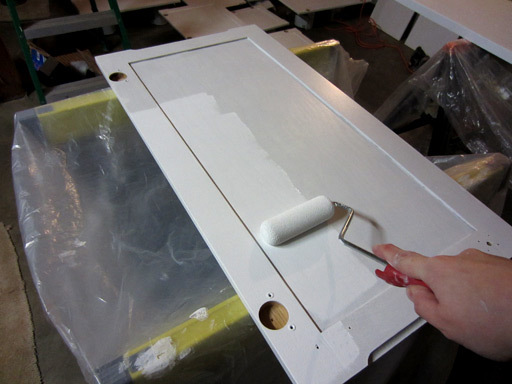 For painted kitchen cabinets, you can’t just slap on any latex paint – it has to be a tougher, more durable paint. For this job, I used Benjamin Moore Advance Waterborne Interior Alkyd. Why this paint? My heroes at Young House Love used it for their own cabinets! That’s not like showing up to the prom in the same dress, is it? Anyway, it’s good stuff. 2014 Update: This post is 2 years old, but my cabinets still look like they were just painted! 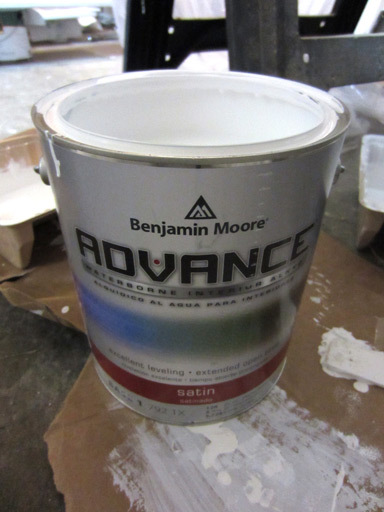 Benjamin Moore Advance has held up beautifully – I highly recommend this product. Anyway, here’s the enamel going on with my little foam roller. Enamel definitely has a different feel to it than latex paint. It’s difficult to describe – I might use the term “less booger-like than latex”. It lacks that rubbery stretchiness latex has. And since it was $50 for the gallon, and went on over equally pricey primer, which went on over hours of sanding work, which followed some serious varnish stripping work, I get to feel like a pro painter and not just some amateur sloshing around cheap paint from the hardware store. Thin and even coats is the trick to perfectly painted kitchen cabinets. Don’t rush, this is the homestretch! I am doing the backs first because I want the last, final dry wait to be with the fronts facing up so the finished fronts never touch the paint cans the doors sit on while they dry. I haven’t seen any evidence that this technique is in any way harmful to the paint, but just in case – the final “front coat” will not touch the support cans! While the final coat of paint on the cabinets dried, I repeated all of the steps on the pantry door.